It’s not the (alleged) stroke, it’s the coverup. That was the message from Walt Maddox and his campaign on Thursday, as they took shots at Gov. 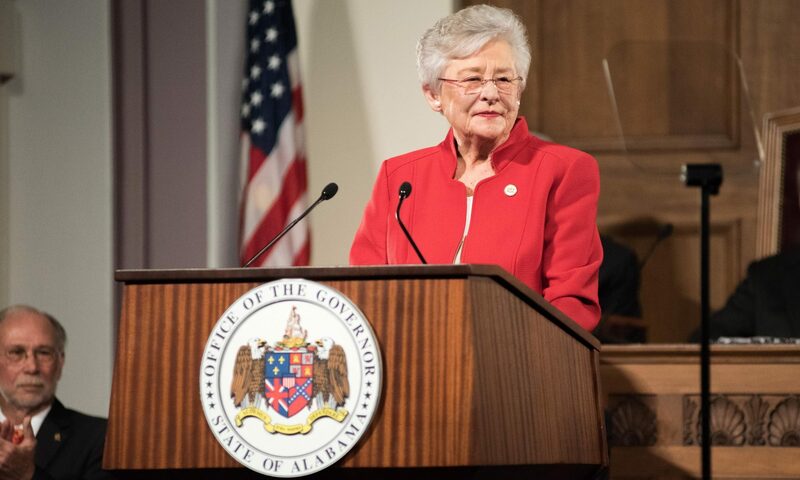 Kay Ivey for allegedly directing her security detail to cover up a health scare in 2015. She’s also alleged to have demoted a state trooper from her security team after he refused to conceal from his superiors a trip to the hospital Ivey was forced to take while attending a conference in Colorado. And the story could use a little refocusing. After APR’s Bill Britt wrote a story Monday that quoted former Alabama Law Enforcement Agency head Spencer Collier confirming the hospital trip for “stroke-like symptoms” and providing details of his conversations with Ivey about demoting the trooper, the story from state media outlets veered off course. Instead of the focus landing on Ivey’s mistreatment of a law enforcement officer who was simply doing his job correctly, it became all about her health. Was she sick? Did she have a stroke? How’s her health these days? Those are all fair questions. They’re just not THE question that should have come from Collier’s revelations. Because if Ivey did what Collier alleges, she possibly broke the law. And maybe, more importantly, she took money out of the pocket of a trooper who was trying to support a family simply because he refused to conceal her trip to the hospital. That sort of behavior … well, we’ve seen that before in this state. Mike Hubbard and Robert Bentley both went after law enforcement when they were initially caught in lies and illegalities. Hubbard tried to defund the entire Alabama Attorney General’s Office and squeeze the prosecutors on his trail. He later launched public attacks against the lead prosecutor, Matt Hart, in a failed attempt to get out from under his misdeeds. 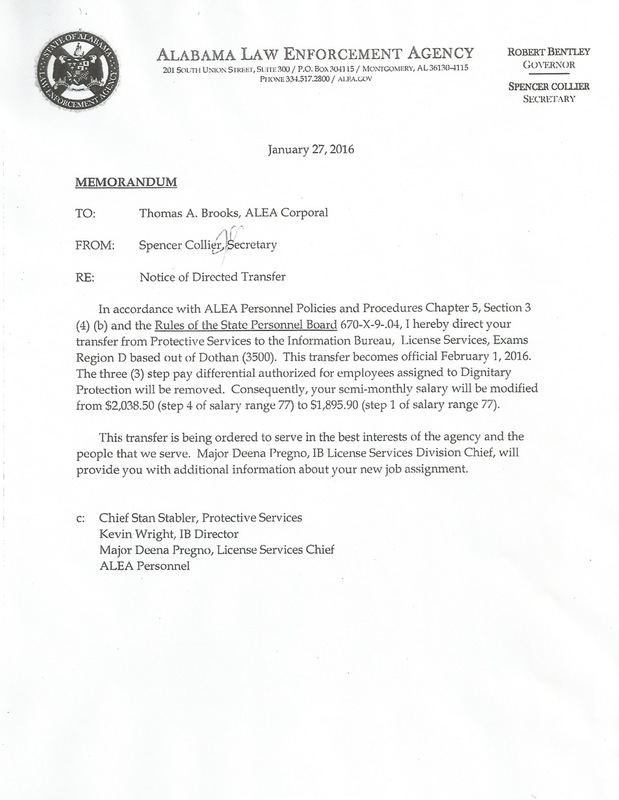 Bentley asked Collier, who was then head of ALEA, to lie to AG’s office investigators. And when Collier, after being terminated by Bentley for refusing to lie, told the world of the then-governor’s affair, Bentley set out to ruin the man. Both Bentley and Hubbard wound up in jail for brief periods. And Alabamians wound up with more black eyes from the nation’s most corrupt state government. That’s why this deal with the trooper matters so much. Because it speaks to the character of Kay Ivey. I mean, would she really demote this poor guy — the same trooper who sat by her hospital bed for three days — force him to uproot his family and go from the Montgomery area to Houston County, cut his pay and stifle his career because he followed trooper regulations instead of her improper/illegal directives? Because I think that’s something we should know. Ivey, in response to Maddox’s comments on Thursday, told reporters that they should “check” the facts on the trooper, Drew Brooks. 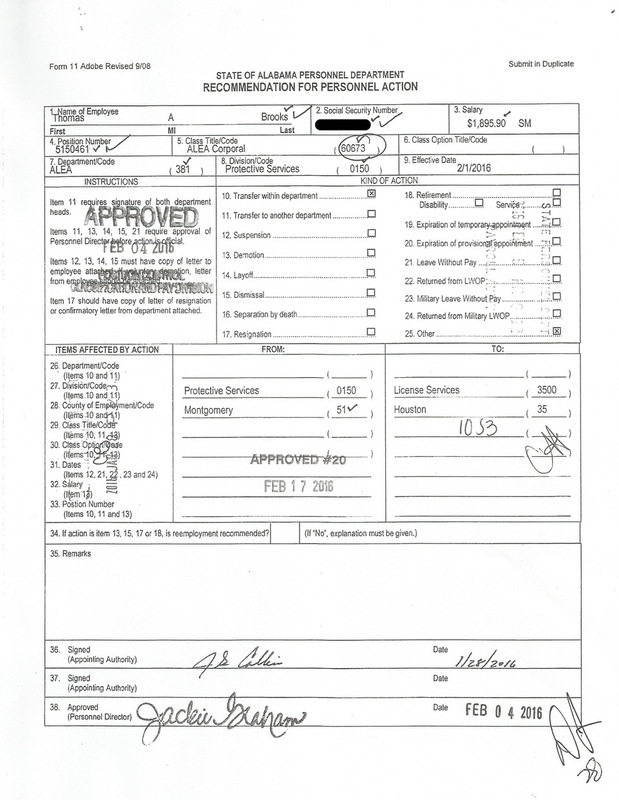 I have copies from his personnel file showing where he lost pay and was sent from the governor’s security detail — a sought-after position — to giving out drivers licenses in Dothan — a very much not-sought-after position. If Ivey has records indicating these things didn’t happen, I’d love to see them. And I’d also love to see records of her trip to Colorado in 2015. Because right now, this is looking like a very familiar road. A candidate who won’t debate. A politician who plays a little loose with the rules and law. A career politician who would do anything to stay in the game. A desperate politician who will stoop to any level to conceal their flaws and errors. It all rings a bell, doesn’t it?